Have a round hound? Consider what factors (including you!) could be contributing to your pet’s girth before taking drastic measures. 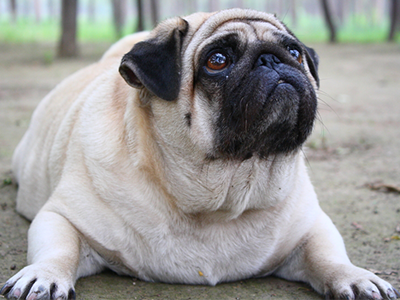 Try these simple strategies for doggie dieting. From The Royal Treatment: A Natural Approach to Wildly Healthy Pets. 1. Feed less. Pooping more than twice a day usually means your dog is processing too much food and will not lose weight. The 1% bodyweight your dog lost over six months is not visible on my weight loss graph. It may be just the difference in weighing before and after urination. Feed less. 2. Choose a low-carb, excellent food. 3. Substitute freeze-dried meat treats instead of baked treats with wheat or corn. 4. Fill a begging stomach with low-sodium green beans and/or rice cakes, and other vegetables (no onions, grapes, or raisins). Adding a thin schmear of meat baby food (no onions) or butter to his rice cake can make a dog think his life is grand. 5. Don’t feed high-carb treats out of guilt because you don’t have time to hang out. Most dogs love green beans. Freeze-dried meats and rice cakes are crunchy fun for them (I asked them). They snap them up so quickly, they hardly know what they are. If they don’t like the treat you’re offering, fine. You are not trying to convince them to eat! 6. Change your behavior. When dogs beg for food, offer playtime and petting instead. 7. Consider using supplements or herbs to help with joint function and appetite. Seek good veterinary advice before trying them. 8. Have your vet do blood work to check thyroid function, which could reveal other problems relevant to diet and weight loss. In this scientific guide to animal needs, renowned veterinarian Dr. Barbara Royal presents her groundbreaking treatment methods that will do wonders for your pet’s health and happiness. Take care of your pet naturally! • How to clean your dog’s, cat’s, or rabbit’s ears—the right way! These pages shimmer with ingenious advice that combines common sense with holistic medicine and the best of modern science. A passionate, dedicated, and innovative veterinarian with a background in zoo and wildlife medicine, Dr. Royal empowers animal lovers to lift their pets into a realm of natural health and happiness that will be palpable from shiny coat to bouncy step. 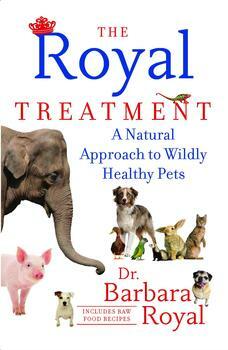 Dr. Barbara Royal is a veterinarian and the founder of The Royal Treatment Veterinary Center. She has appeared on The Oprah Winfrey Show and was a featured veterinarian on the Smithsonian Channel. She lives in Wilmette, Illinois with her husband, two children, her cat, Flag, and her dog, Henry.